From a general design standpoint, how has Trespasser compared to the other projects you’ve worked on? Although I was at Looking Glass for a fair amount of time, the way the schedules and my assignments worked out I was never involved in a game during the middle period of a project – I assisted two different titles in their final few months, where design input is limited to “Is there a way to make this a little bit more fun in the next day?” and wrote several design docs for projects which never quite got off the ground, and initial game designs are always starry-eyed “And we’ll do this, and this, and this” types of documents, so Trespasser is really my first exposure to the real meat of game design – actually trying to work out and implement all the fine details of your plan, and adapt them day by day as you learn more about the strengths and limitations of the technology and art in your game. Would you say that Trespasser is harder to design for, because of the physics engine, or easier? Some of both, really. When you have the level of physics that we do, you don’t have to write any script code whatsoever to get things to fall over correctly, which is a comparatively diffi-cult thing to do in the Doom and Quake games which don’t usually have any object physics in them. On the other hand, because no-one has ever had the kind of physics we do, we have to come up with a whole new bunch of standard puzzles – it’s been my experience that game designers come up with a set techniques for whatever engine they work with, and use those to bulk out their games, with the really innovative “how’d they think of that?” stuff sprinkled through every so often, and it’s the latter that the designers actually spend the most time on. In 3D shooters, for instance, you almost always see what we called the “Doom joke” at LG, where you step into a room with a tasty-looking key or other item and when you grab it you get locked in and a whole bunch of monsters come out. This gets used in nearly every game of this type because it’s easy to do and guarantees a certain amount of gameplay. We have to both invent our own “Trespasser jokes” and all the other one-shot amazing scenes, which is a bit draining. Is there a lot of pressure on you from Amblin because of the license, or have you had a lot of freedom? Complete freedom, since I’ve been here. I have no idea what we had to go through to get that kind of freedom, it all happened before I started. Also, it’s Universal who holds the JP license, which could complicate matters even further since they are one tier away from DreamWorks, but we get no interference. It’s great, a lot better than Certain Other Licenses TM I’ve worked with in the past. Can you say anything about the type of puzzles we can expect in Trespasser? We will have a fairly broad range, from improvising walkways across collapsed sections of bridges to figuring out ways to get past or drive off dinosaurs you wouldn’t stand a chance of killing to (possibly) doing some logic-based puzzles with electrical equipment, to climbing to the top of buildings by making a stack of boxes. Our puzzles will all involve physics in some way, however – we never send you to another screen to do anything. If you have to swap some fuses around, you will open up the fuse box, pull out the blown fuses with your hand, and go find some new ones to put in place. Players will need to think about our puzzles in a much different way than they are used to in adventure games – it’s not going to be a game about finding tons of obscure items and trying to use them on everything until you find where they work, but more an application of physical common sense – almost a science-fiction ver-sion of Outward Bound, as I said before. What aspect of Trespasser excites you the most? The physics, by far. We have an incredible outdoor renderer, too, but the gameplay will come from the physics. What do you think Trespasser offers a gamer that nobody else is doing? We are making a 3D game that’s not a shooter and not a console-style product like Tomb Raider. In fact what we’re really doing is building an adventure game where instead of ex-periencing the world through some distancing mechanism like a 3rd person view or a Myst-style slideshow, you are really there – I hear Quake players clamoring for more story, and many of the Quake clones are announcing that as one of their selling points, but they’re still shooters at heart – our goal is to make a game where you experience an incredible story as if you are really living it. The UI has been a topic of major discussion lately on the message board. It has been said that in Trespasser, you actually have an “arm”. How difficult is it to manage this? If you mean how difficult is it to use the arm, it will be very simple – since the average user doesn’t have a data glove, we can’t give players control over all the fingers. Our interface will concentrate on getting the hand near what you want to interact with or grab, and then once you decide to grab physics takes over to guide the hand and fingers into the appropriate grabbing position. Once you have something in your hand, you can drop it or use it, and use will result in different actions depending on the object – use will fire a gun, for instance, or swap the gun into clubbing position once it’s empty. Keyboard and mouse. I’d like to also have a mouse-only mode so that people who are really scared by computers can have some initial success getting into the game, but it may not be possible, and it would also be a vastly inferior method of playing. Is there a separate inventory screen? No. You have a limited number of spots on your belt to hang things from, and you look down at your belt to put them there or take them off. You won’t be able to stores things which won’t hang off a belt, either, like huge crates. If you want to take a crate to the other side of the world, you’ll have to lug it there in your arms – just like the real world. In Trespasser, can you climb trees? No. This was one of the first questions I asked, too. Beyond the fact that we’d have to com-plicate our interface to accommodate it, it’s not in the cards for physics for this project. Get-ting legs to shimmy up a trunk is a lot different than getting them to walk. Are there any air-borne dinosaurs? No, for the physics reasons again. Also, since we didn’t see the pterosaurs for more than a few seconds at the end of Lost World, we don’t have any behaviour from the film to emulate. I also suspect that they would end up being pretty unfun – they’d streak down at the player from some direction way up in the sky where the player wasn’t looking, and then it would all be over! Do you feel the lack of levels in Trespasser is an advantage? Definitely. The best thing I’ve heard about Unreal is how you’ll be able to retrace your steps at any time, and the fact that Quake II is finally adapting the Hexen hub concept is great, too. It feels so arbitray and video-gameish to run to an exit and hit a loading screen, and then repeat, with occasional boss. 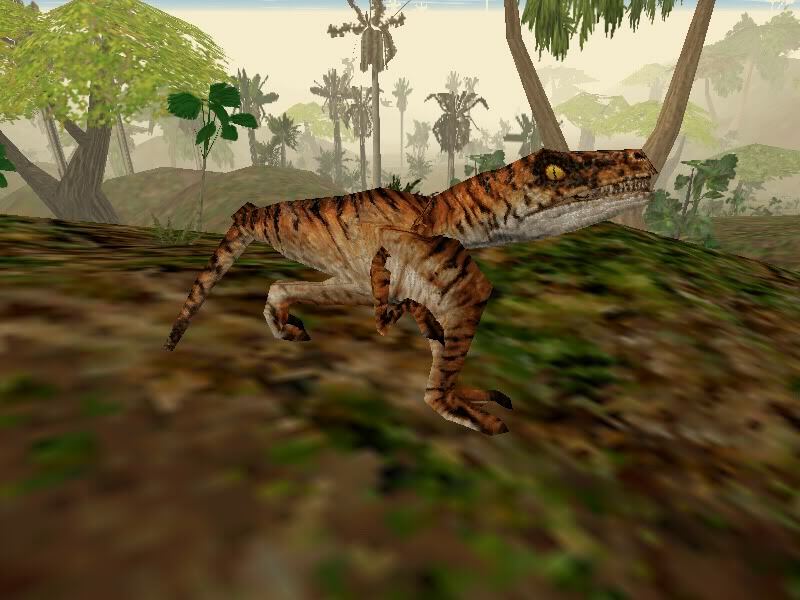 If you can find a way to get somewhere in Trespasser, you can go there – however, this is a mountainous jungle island, and you will run up against unclimb-able spots in many places, or cliffs you have to jump down which you won’t be able to climb back up. What steps have you taken to insure a semi-linear story? See the above comments – there are some obstacles which you can’t cross until you’ve fig-ured out the puzzles in an area. Our ‘areas’ are very large, though, and based on our initial impressions of some early sections of terrain, it’s very easy to get lost within as little as a square kilometer of terrain, and even when there are dozens of distinctive features in the ground textures, in the shape of the ground itself, and in the arrangement of trees and ferns and stones. How far along in development are the sound effects in Trespasser? The music? SounDelux, the Hollywood sound designers making our effects, is working with a list of what we think we need so far, which gets updated pretty frequently. Our music basically exists, but I don’t think I can say much more than that about it. It will be all 16-bit digital samples, no MIDI, and it will play occasionally, not continuously, so when you hear it, it will be unique and beautiful and you will want to listen to it, instead of just turning it off. If you made the decision to make a multiplayer add-on, what form would it take? Would there be team play? Total mele? CTF? I think that Trespasser is not ideally suited to conversion to multiplayer, personally. I’m a little more in favor of cooperative multiplayer than competitive myself, and I think it would be a blast to have short scenarios where you play hunters and have to track and take out a T-Rex or something, but my approach to multiplayer games (I worked extensively on two different designs for multiplayer versions of Terra Nova at Looking Glass) is if any of the styles of mul-tiplayer can be made fun, to include them, because not all people are looking for the same type of play. By the same token, if you find out that your death match or CTF or coop isn’t fun for some reason, then I think you shouldn’t include it. I believe the real solution is to do an-other product using this engine specifically designed for multiplayer, though. Shoehorned multiplayer adaptations of single-player games rarely work from what I’ve seen. You mentioned to me that you’re playing Ultima Online….do you consider this to be the future of games? What place does a pure single-player game like Trespasser have when UO and games like it eventually dominate the marketplace? Ultima Online shows that if these are the future of gaming, that future is very far away. The significant thing about Ultima Online to me is it is one of the first online games I’ve seen where the graphics are approaching the standard of single player games. I always think there will be a place for single player games, for times when you want to experience a deep story on your own terms and schedule, and eventually the marketplace and especially the gaming press will understand that. You simply can’t tell a compelling story in an online environment – players may be able to forge one for themselves, but they will pretty much ruin anything you try to force them to play along with, which Ultima Online already demonstrates. There is hardly a single living NPC in their world right now because they are being slaughtered as a convenient source of cash and items. Seemingly the average player there just doesn’t care one bit for the Ultima world, and only wants cool armor and weapons to go chop up monsters and other players. This makes me very upset because I love the Ultima world, and I want it to be just as friendly online as it is in the single player versions. Mac I don’t know about, and consoles would be flatly impossible, due to their lack of memory and hard drives to hold all the data our game will be constantly cacheing and decacheing. What is the one thing you think Trespasser is missing, and why? Trespasser could use other people in the world, but a decision was made not to include them because real-time rendered faces just look like crap now. Most game companies can’t even make decent human faces in pre-rendered movies (have you ever actually looked at Lara Croft’s face? Scary!). As soon as faces can be made to look decent and expressive on real time models, we’ll do a game with other characters. Conversation is a problem, too, but po-tentially more solvable. How many of Trespasser’s objects are manipulatable? 50%? less? More? If you see something that isn’t nailed down and would in the real world be light enough that you can pick it up, you’ll be able to pick it up. If a thing is so big and heavy you can’t pick it up, but not so big that you wouldn’t be able to shift it with a lever or by knocking something else (say, a dinosaur…) into it, it will be able to move, too. You probably won’t be able to knock branches off trees, but they’ll mostly be up out of your reach, anyway, and beyond this we are being very careful with our selection of objects in the game – if the object would do something in the real world that we can’t make it do in our game, it just won’t be there. An abandoned, decrepit island gives us a perfect excuse to do this. Players will find nothing but objects that work almost exactly like they expect them to. What’s your favourite game these days? Probably the Microprose version of Magic: The Gathering. I’m really looking forward to add-on card packs – I love Magic but hate buying the cards and spending the amount of time it takes to play against a human. Their on-line version is potentially exciting, too. I vary among games in the Ultima series from Ultima 6 to Ultima 7: Part II. I’ve often said that the Worlds of Ultima title ‘The Savage Empire,’ produced by Warren Spector who also pro-duced LG’s Origin titles and has since become a good friend of mine, is my favourite. What game would you say is the closest to Trespasser in terms of gameplay? How do you describe Trespasser to others? “The digital sequel to The Lost World.” Heh heh, just kidding. I say it’s a 3D first-person ad-venture game with real-world physics and an amazing jungle renderer. Has Spielberg seen Trespasser? What was his reaction? He’s seen it quite a few times at various stages of development. I got to show him a few of our objects and some early design work for about five minutes a few weeks before The Lost World came out, and he seemed pretty excited about and completely in tune with our phys-ics-based design and engine philosophy. After completing Trespasser, what is your next project? We rarely know that in the games industry until after we’ve actually completed our current project, but I can say that I’d really like to work with our engine some more, and I’ve been having a hankering to do a deep, Ultima-style RPG for years (for 1-4 players cooperatively, ideally).